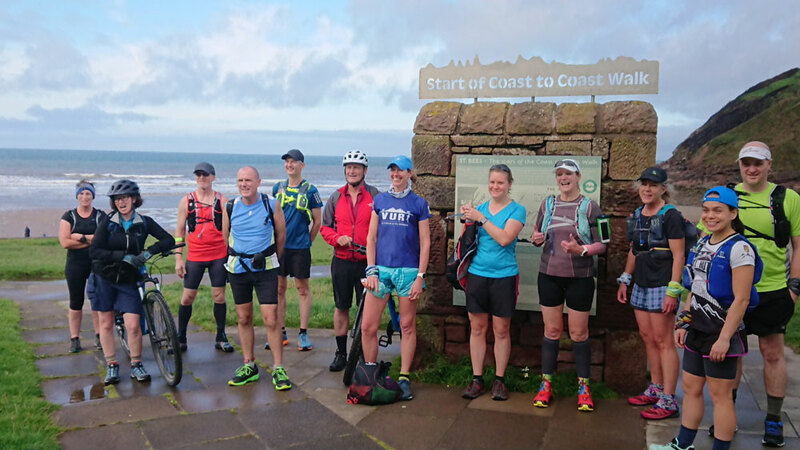 Ou r guided run began at St Bees and was completed in Robin Hood’s Bay where we launched our pebbles into the North Sea. The best way to summarise our wonderful 10-day adventure as an Anglo-Aussie troupe would be “Runnable, and ending in a pub”. From walking over three weeks, cycling over three days or, like us, running over 10 days. It goes without saying how wonderful the scenic views along the Coast to Coast route are to any adventure. Every time we take this route it showcases a completely different set of tales, new experiences, and surprises. On a sunny Saturday afternoon in the beer garden of The Manor in St Bees, thirteen intrepid souls met together for the very first time . By the time we all jumped into the North Sea, at the end of our journey together, the bonds of friendship, shared pain and joy ran deep. We may have been runners, most of having done ultra-runs or marathons, but there were still nerves among us. After all, running 300km would see the body and mind put through a lot. Not to mention the vagaries of the weather – and it was so ironic that after three months of hot, dry summer, it broke before our Aussie friends landed. Yet, a beer or two soon helped ease any tensions and warmed the conversations as strangers became friends before we had finished the first lunch. Chris, who runs Tour de Trails in Australia marketed the trip as Trails and Ales. To make sure he wasn’t taken to task under the Trades Description Act, each day’s run had to finish in a pub serving local real ale. Now, those of you who have walked the route or are familiar with the culture of the North will know, that it is not hard to come by. By the end, the count was over 40 different real ales, many of which were brewed within 30 miles of where we drank them.